This update photo shows Iceberg and Romaine cos lettuce growing undercover in our tropical location, tended by my husband Alastair and worker Koreece. The mesh keeps out most insects, though we also use non-toxic sticky fly-traps and spray against leaf miners. I am quite interested in this form of agriculture. I live in Siparia and would be glad to get more information on this. Hi, I have a BSC in horticulture from Iran, I am interested to work in greenhouse. I am living in Trindad. Am I right in thinking you are located in Princes Town. Is there anyway I can get in touch with you? I'm trying to start a greenhouse and would appreciate some advice. I was also thinking of venturing into hydroponic farming. I have NO idea how long this has been posted though or if you keep track of comments, but I do hope so. I bought a piece of land in Panama and I am planning to go there to grow vegetables. What you did in Trinidad is a great inspiration to me I would like to ask you what materials you used for the roof of your greenhouse in Trinidad. I think Panama and Trinidad have similar weather. Also, Can you recommend me a book that will teach me how to build the greenhouse? Amazing research and development project. I look forward to seeing the results. 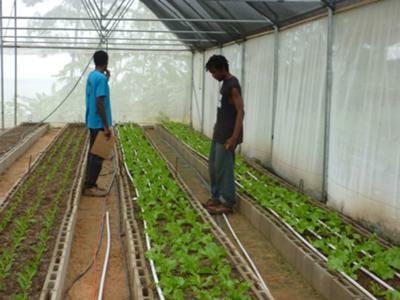 I am a Trini agriculture student and I hope that one day, visiting your greenhouses would be a possibility. Thats looks fantastic, very professional, well done!!!!!!!!!!! !